Crash Ties Up Morning Rush Hour. Santa Day a Big Hit! At 6:27am a Chevy Suburban being operated by Mohammad O. Faroque age 47 of Princeton was headed northbound on Route 1 near Route 522. Faroque made a fast lane change from the middle lane to the left lane. As he made the lane change he struck a Honda CRV that was headed northbound on Route 1 in the left lane. The collision forced the Honda CRV to strike the divider and flip on its side. The driver Grace Adu age 62 of Plainsboro was trapped in the vehicle. 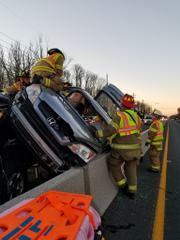 The Monmouth Junction and Kingston Fire Departments had to cut the roof off the Honda CRV to free Adu. She was taken to St. Peters University Hospital in New Brunswick by South Brunswick EMS for treatment of non-life threatening injuries. The extensive extrication and crash cleanup created heavy delays throughout the morning rush hour. All lanes of Route 1 were reopened at 8:30am. South Brunswick Police Traffic Safety Bureau Officer William Beard is investigating the crash. 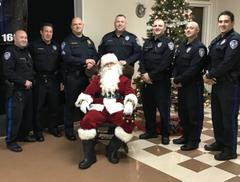 The Annual South Brunswick Police “Meet Santa Day” was a huge success this past Sunday with over 325 kids coming to meet Santa. The day which is sponsored by the local PBA and FOP police unions allows children to meet Santa, get a small present and enjoy some food. Officers handed out over 700 toys to children who attended the event. Chief Raymond Hayducka said, "Santa Day seems to get bigger each year it’s held. The children get to interact with the Officers and create memories together. 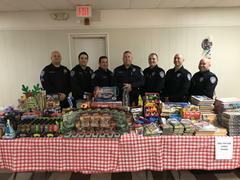 This event continues to strengthen the positive relationship between the South Brunswick Police Department and the community.” Chief Hayducka thanked the VFW Post 9111 and South Brunswick Lions Club for their support of the event.